Everything you need in an optical drive. 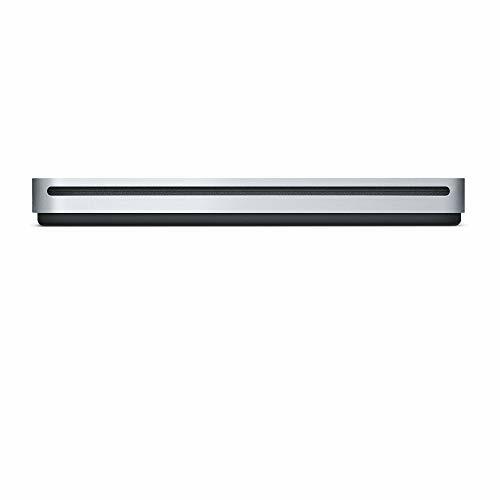 Whether you’re at the office or on the road, you can play and burn both CDs and DVDs with the Apple USB SuperDrive. It’s perfect when you want to watch a DVD movie, install software, create backup discs, and more.Take it anywhere. Only slightly bigger than a CD case, the Apple USB SuperDrive slips easily into your travel bag when you hit the road and takes up little space on your desk or tray table when you’re working. The essence of simplicity.You’ll never have to worry about lost cables with the Apple USB SuperDrive. It connects to your MacBook Pro with Retina display*, MacBook Air, iMac, or Mac mini with a single USB Type-A cable that’s built into the SuperDrive. There’s no separate power adapter, and it works whether your Mac is plugged in or running on battery power. *MacBook Pro models with Thunderbolt 3 (USB-C) ports require a USB-C to USB Adapter (sold separately) to use Apple USB SuperDrive.